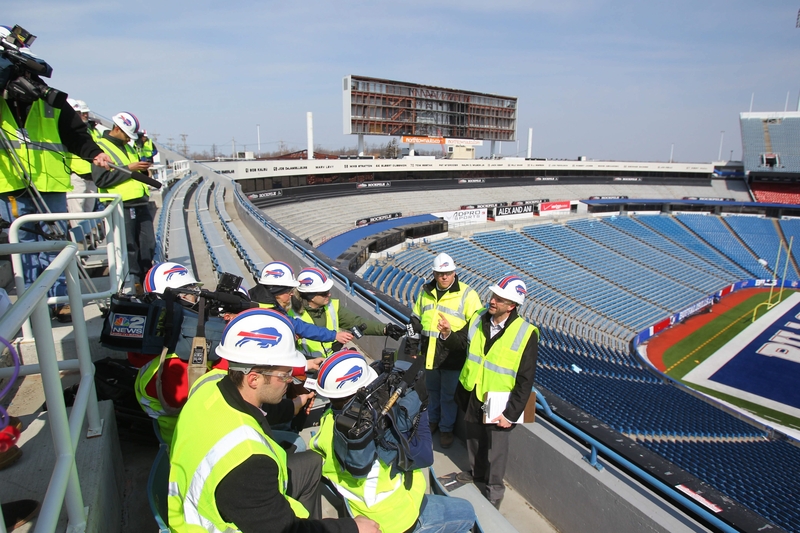 Marc Honan, the Bills’ vice president for marketing and broadcasting, makes a point Tuesday as he and Joe Frandina, to his right, director of construction management, conduct a tour for reporters showing progress of the $130 million in renovations at Ralph Wilson Stadium. Is stadium revamp enough to keep Bills? The death of Buffalo Bills owner Ralph C. Wilson Jr. raises questions about whether the $130 million project to renovate the stadium that bears his name will be enough to keep it viable in the hands of a new owner. Hours before news broke of Wilson’s death, reporters got a behind-the-scenes peek Tuesday at the stadium improvements that are under way. The project was negotiated in late 2012 among team executives, Erie County and New York State, with an eye toward keeping the team in Orchard Park as long as possible, even with a change of owners after Wilson’s death. But the stadium’s age has prompted some to question whether the renovations will be enough to keep the team in town under new ownership. The project pales in comparison to major construction projects that have taken place across the National Football League to renovate aging stadiums. The league’s oldest, the Green Bay Packers’ Lambeau Field, has undergone nearly $400 million in renovations in recent years. In San Francisco, the 49ers expect to kick off the next season in a $1.2 billion new stadium after playing their last regular-season game in Candlestick Park. Ralph Wilson Stadium, which opened in 1973, is the sixth-oldest NFL venue and will be 50 years old by the time the team’s current lease expires. When the project is done at the start of this season, blue-collar fans – from the sidelines to the top row of Section 335 – will benefit from amenities previously reserved for those buying the most-expensive tickets. “You see exactly what that is when you do a tour of the work that’s being done,” said Erie County Executive Mark C. Poloncarz, who donned a Bills’ hard hat, neon-yellow construction vest and goggles. “The vast majority of that is going to create a better experience for the fans,” Poloncarz said. “I think when the fans return here in the fall, they’re going to see, what is not a brand-new stadium, of course, but they’re going to see a different stadium,” Poloncarz said. And, in this case, different is nice – quite nice. A heated “East End Lounge” will feature Duff’s chicken wings, tables and televisions behind the eastern end zone. Five new concession stands are planned. All 43 stands will come with better food choices and the option to pay with a credit card. Fourteen new restrooms – a nearly 30 percent increase – will be built. A swanky 8,000-square-foot Bills team store will open along Abbott Road in front of the stadium. “This will be our new front door,” said Marc Honan, the Bills’ vice president for marketing and broadcasting. The new team store will be within the confines of the stadium gates and give fans in-game access. Tributes to the team’s “Wall of Fame” members will be included. Those will include upgrades to the stadium’s scoreboard. A new nearly 5,400-square-foot high-definition scoreboard will be installed across the western end zone. Additional scoreboards, for in-game advertising as well as out-of-town scores and oodles more NFL statistics for fantasy football buffs, will be put up on the east end of the stadium. The team’s broadcasting facilities and press box are also undergoing floor-to-ceiling makeovers. The press box will be relocated to the southeast corner of the stadium, where the Red Zone Club was formerly located, and will house more than 190 press members for most games. The press box will be able to accommodate 40 additional journalists for larger events. Red Zone members will be granted membership in the Goal Line Club. In all, 350 employees have worked through the winter to upgrade the stadium. The improvements include more than 5 million pounds of American-made steel. Lt. Gov. Robert J. Duffy, a former Rochester mayor and lifelong Bills fan, joined the stadium tour. The state will pump the largest share of funding into the renovations – about $54 million – with Erie County spending $40 million and the Bills spending $35 million. “It is about building the fan experience,” Duffy said. “This is probably the best stadium in the country to watch an NFL game from.